The regal Jackson JS32 King V has a basswood body, bolt-on maple speed neck with graphite reinforcement, compound-radius (12"-16") bound rosewood fingerboard with 24 jumbo frets and pearloid sharkfin inlays, and bound headstock. 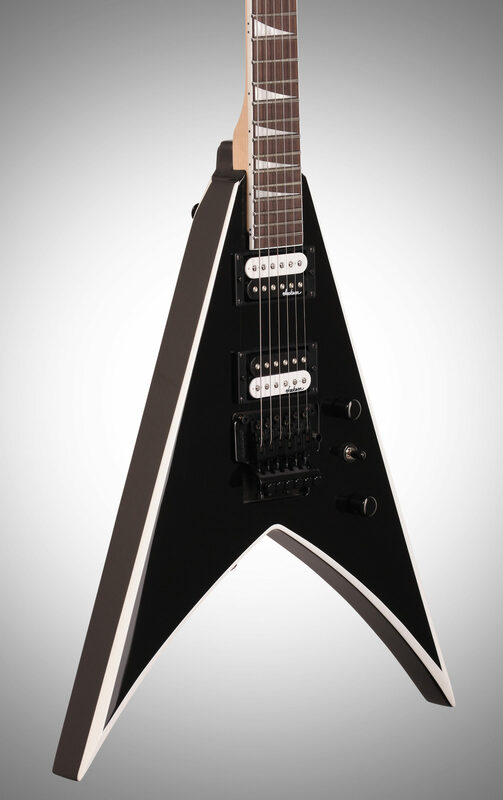 Other features include dual high-output Jackson humbucking pickups with ceramic magnets and three-way toggle switching, Jackson-branded Floyd Rose double-locking tremolo bridge, black hardware and die-cast tuners. Swift, deadly and affordable, Jackson JS Series guitars take an epic leap forward, making it easier than ever to get classic Jackson tone, looks and playability without breaking the bank. 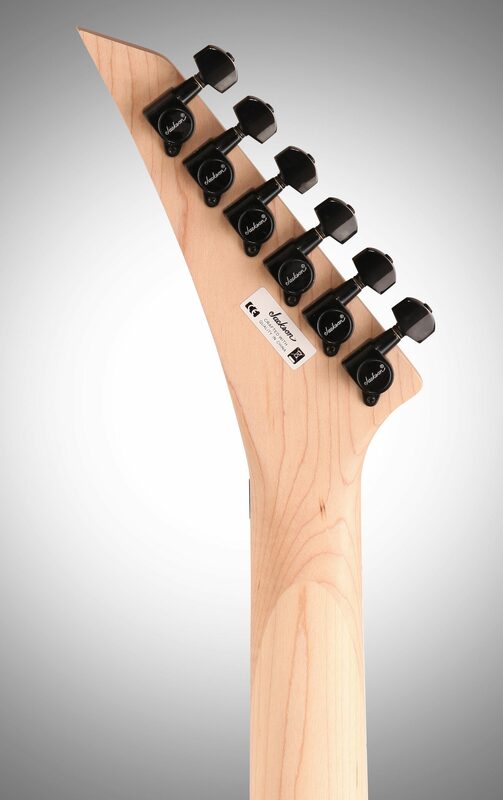 Upgraded features such as striking aesthetics, high-output ceramic-magnet pickups, graphite-reinforced maple necks, bound fingerboards and headstocks, and black hardware deliver more for less. Sound: Has a really versatile sound. Doesn't have any problem getting into those growling lows, but still screams on the high end, too. 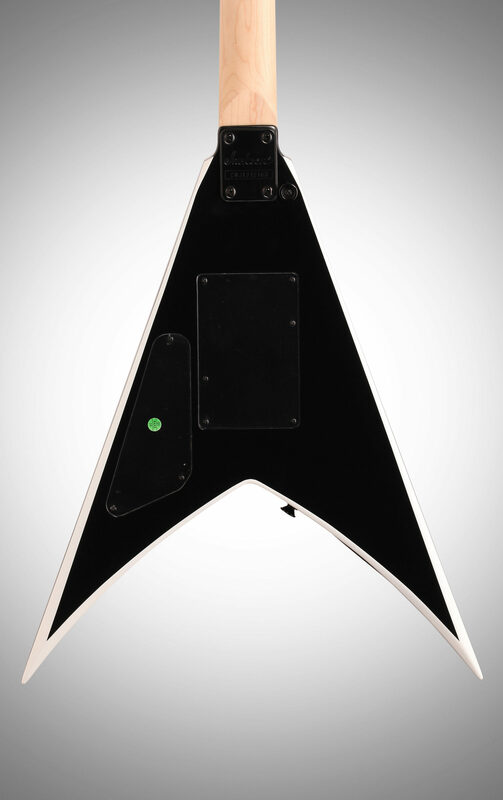 Works well as a rhythm or a lead guitar with the stock pickups. My only complaints are, as another reviewer said, the pickups are slightly microphonic, not really shielded well/at all, and it doesn't have a whole lot of sustain on the high end. Feature: There's not really a whole lot to throw in this part. 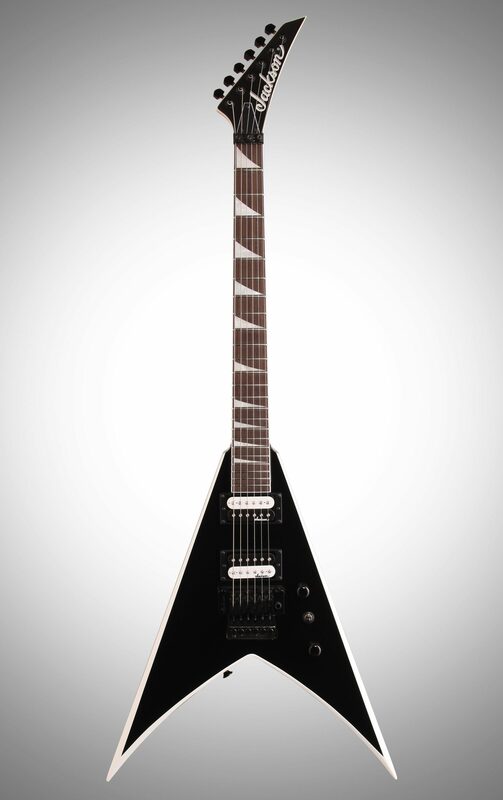 It's not the lowest end of Jackson's axes, but it's still in that budget category. 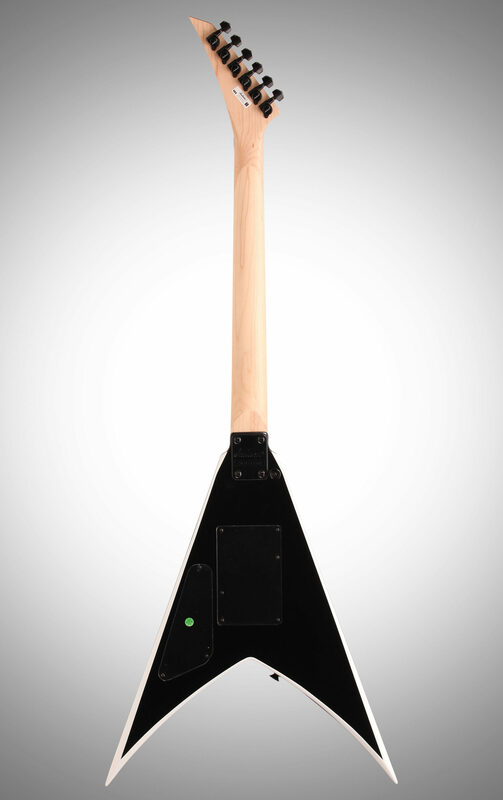 It's high enough that it isn't dull, bland or "Vanilla," and has nice things like the Floyd Rose, and the Compound Radius neck, but low enough that it's made out of basic materials: Basswood body, Maple neck, rosewood fingerboard, basic 1x tone, 1x volume, 1x 3-way switch for controls. Ease of Use: Nothing to it. Stretch your strings, set that Trem up, and it's good to go. Keep that gain back and you get nice, smooth cleans, pour on the gain and you've got chugging riffs, blistering solos and a perfect metal tone. Obviously it's got a Floyd Rose on it, which isn't really something a brand-new guitarist should be looking at, but it's low enough on the spectrum of guitars that if you have been playing for a while, and you want to step into the Tremolo world, this would be a good starter guitar. Other than that, it is a V. Sitting down to play it takes some real getting used to. Quality: It's a Jackson. I've had this one for about 4 months now, and I have another Jackson I've had for about 1 year and neither one has let me down in any way shape or form. Yes, this a "Budget," or "Low-End" guitar, no it isn't made poorly. 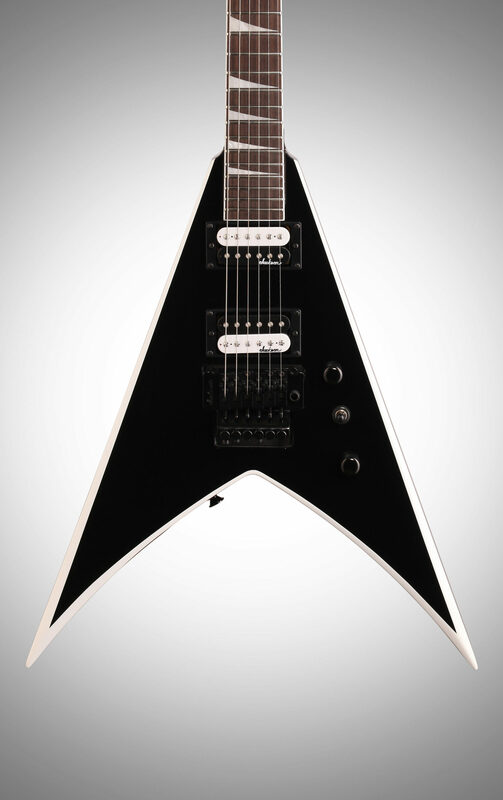 Jackson pours the same amount of attention into building and setting up these guitars as they do in their higher-end rigs, the only difference is the materials, pickups and control schemes. Value: Is it worth it? Yeah, it's worth it. You buy this guitar and you've got an axe with some real solid metal pickups, just as suited to rhythm playing as it is to lead, even in stock form, a 24-fret, rosewood board(and it's unusually dark for rosewood, or at least mine is) with a compound radius, a Floyd Rose Double Locking Tremolo, with locking nut and all, and some quality electronics, all wrapped up in an Iconic body style. Great sound, Great playability, Great looks. Manufacturer Support: Well, Jackson does such a fine job building their guitars that I've never had to get in touch with them. 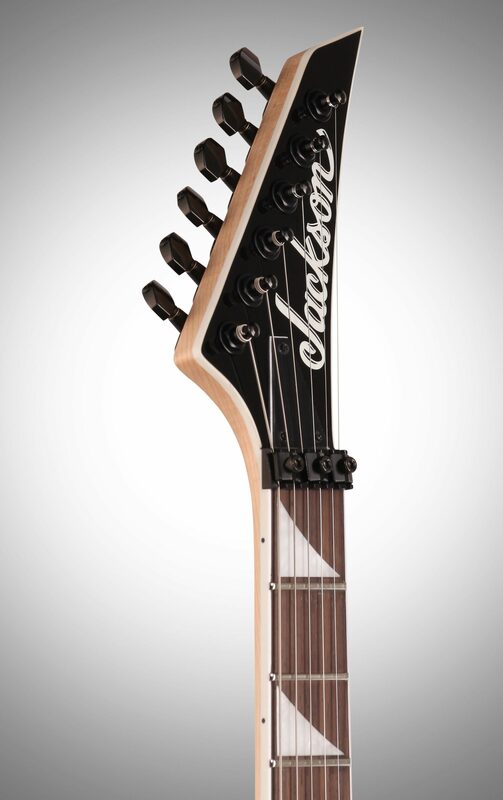 The Wow Factor: It's a Jackson. Like I said earlier, even though the materials may be different, the same quality building and attention to detail gets poured into everything, regardless of price range, and that's where the wow factor is for me - This is a budget guitar, made out of budget tone woods, with base-level pickups, but laid out, assembled and set up like a custom shop. Overall: Great guitar for beginners and pros alike. Won't be disappointed in the least. Style of Music: Everything that rocks, staying closer to the heavy side of things. 8 of 8 people (100%) found this review helpful. Did you? 11 of 11 people (100%) found this review helpful. Did you?